Ever feel like you are just running around on that hamster wheel, stuck and repeating? That’s the Stuck Cycle. It starts with stress and ends with stress. In between are the behaviors you do to cope (but that only leave you feeling worse). 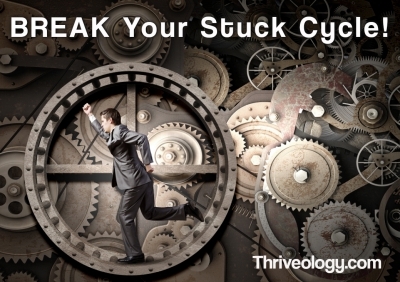 Here’s a little secret: most people live in the Stuck Cycle. That’s the bad news. The good news is you don’t HAVE to. Right now, without knowing it, you are choosing it. And guess what? I was in my Stuck Cycle earlier. I just followed a few steps to break it. In fact, there are 3 steps to breaking your Stuck Cycle. Ready to break it? Learn the 3 steps in this week’s podcast.